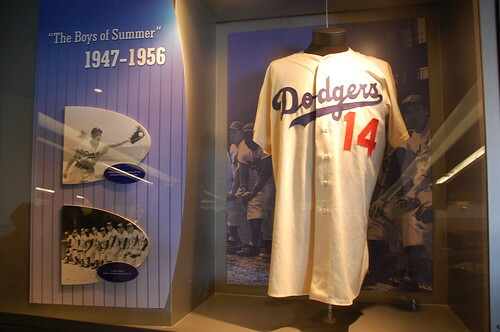 The final destination for this summer’s roadtrip was the most eagerly anticipated one: Dodger Stadium. In so many ways, it lived up to expectations – but in so many, very critical, other aspects, it was a tremendous letdown. The miles of highway and acres of parking lot you will need to traipse through just to reach the ballpark will disorient you something fierce if you are a true city person, who likes walking and public transportation. 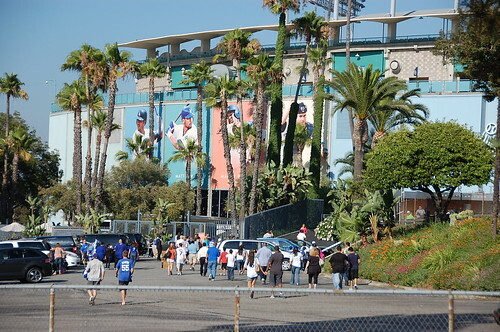 There are people who park at the bottom of the hill and walk up, and I saw buses queued up, but the reality of a California ballpark is that people are going to drive. If you are not one of the beautiful people, however, you are going to walk a very, very long way – by any standard – before you get to the ballpark structure proper. 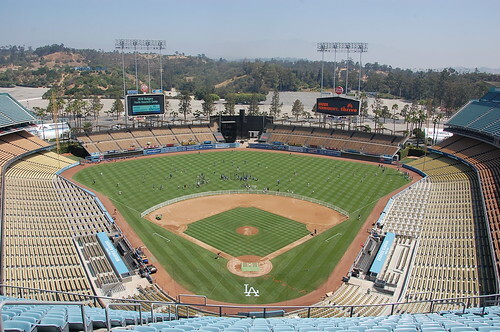 Dodger Stadium is a curiosity, in that there is less actual ballpark structure than you are accustomed to. 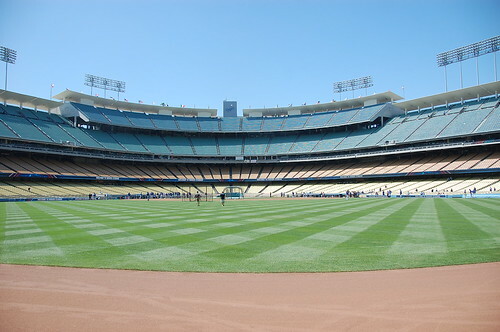 Unlike almost every other ballpark in the country where you enter the ballpark almost anywhere and make your way up to your seat, at Dodger Stadium, you enter at your level. There are stairs and elevators and escalators connecting the levels, but it’s set up so that you walk around the ballpark to the entrance to your level, and you go in there. Think the old bleachers at Yankee Stadium, or the Green Monster in Boston. 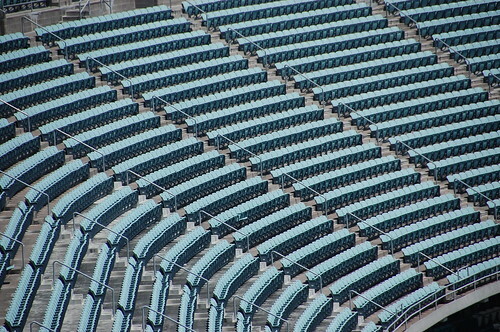 The upper deck is very, very, very high, and very steep; however, despite all of that, the Dodgers were selling season ticket packages in the upper deck, and sold them out. It is an absolutely beautiful physical structure. As the child of a Brooklyn Dodger fan, I hate to say anything nice about Walter O’Malley, but he built a beautiful park. The seats were meant to mimic the ocean, starting at the sand, and edging up to the blue of the deep water. The shelter above the outfield bleachers is meant to mimic the waves. 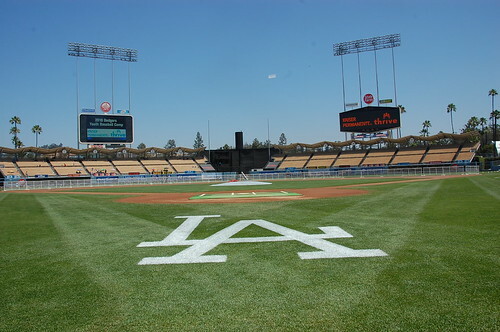 When you look out at the Dodger Stadium outfield, there is nowhere else in the world you could be. Combine all of that with the perfect California weather and almost perennial blue sky, it could almost be baseball paradise. That “almost” is because Dodger Stadium is in LA, and because people don’t show up until the third inning, and when they do, the baseball is incidental to why they are there. It is because BP is even more restricted than Yankee Stadium in many ways. It is because security walks around with headsets and has the demeanor of bouncers at an exclusive nightclub where they’re the ones holding the velvet rope to keep you out. 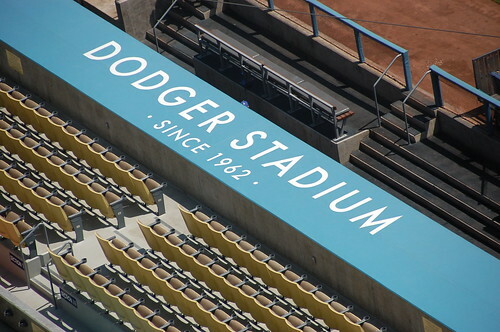 It is because while the field level at Dodger Stadium is about as renovated as a ballpark could possibly be, the upstairs looks like it hasn’t been touched since 1962. It is because of beach balls, and “Don’t Stop Believin'” as the 8th inning singalong. It is because of fans who screamed at everything, whether it was scream-worthy or not, or because of vendors who blocked aisles during the middle of innings with absolute impunity. The palace of baseball has become a place where baseball is the absolute second thought. 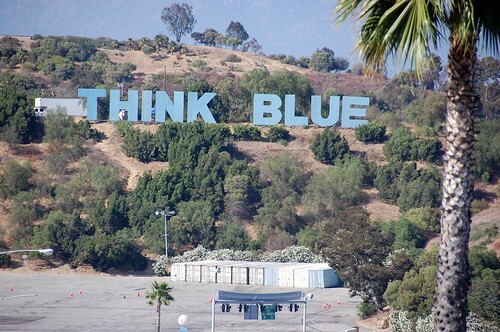 In all of these ways, Dodger Stadium broke my heart. 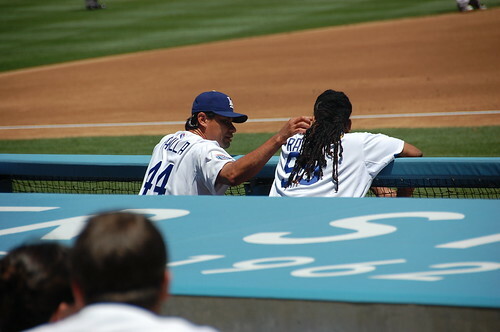 I know that I need to come back, and sit somewhere besides the field level. We spent a considerable amount of money to have wonderful seats, and while they were wonderful, part of me wonders if we had sat somewhere a little less wonderful, maybe people wouldn’t have looked at my companion sideways because he was keeping score. Maybe we would have sat next to the kind of people we met on the ballpark tour, who talked to us thoughtfully about Robert Moses, who had nothing but the utmost respect for the fact that we came to visit from the place that their team came from, that my father’s heartbreak at losing his team was the direct cause of so much joy for them. The disconnect between those people, and the ones we sat with, could not have been more black and white. Those are the people we need to sit with next time. 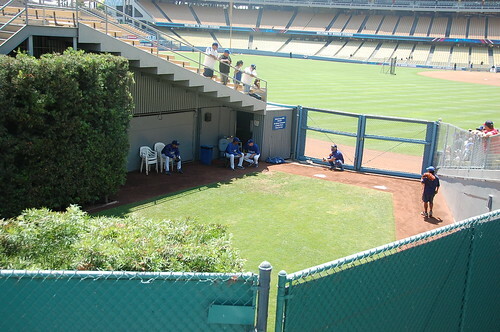 The bullpens are against the left and right field edges; the visitor’s bullpen, like the dugout, is on the first base side at Dodger Stadium, because it is better because of the sun exposure, and because there is a tunnel that connects the Dodgers dugout with the bullpen. 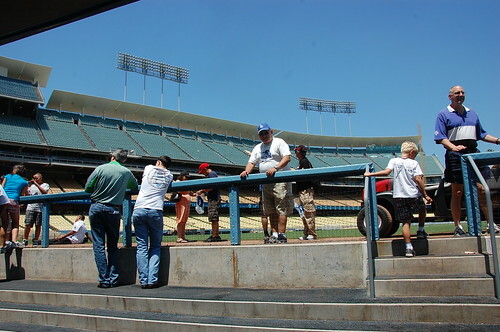 You can go to the area between the bleachers during batting practice, and wait for balls or just take photographs. 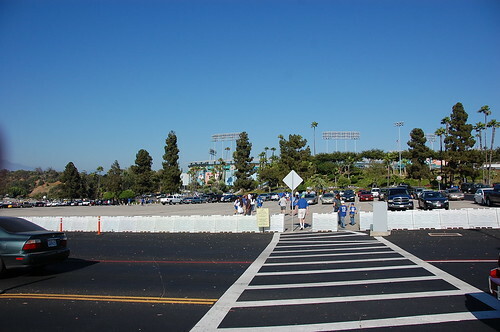 During BP, there is a walkway onto the field for fans to stand on and watch batting practice – however, it is full the second the gates open, and the line stays static for most of BP. It is meant for children, but it is a small area that is crowded with a lot of adults. I did not even try to go there. 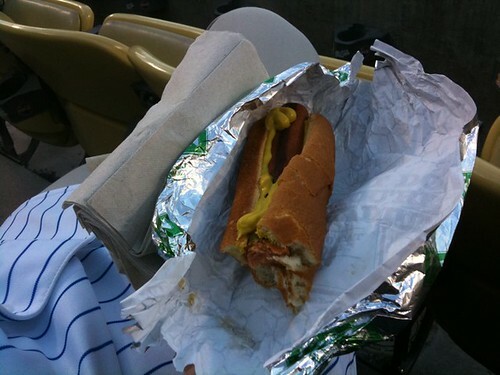 The food at Dodger Stadium is nothing special. Nathan’s hot dogs laugh in the face of Dodger Dogs. The concourses are not wide, and there isn’t a lot of room to start putting in premium food concessions. It is probably better that way, because if there was good food, it would only be accessible to a tiny portion of the fans anyway. There is enough of a divide already between the haves and the have nots at this ballpark. 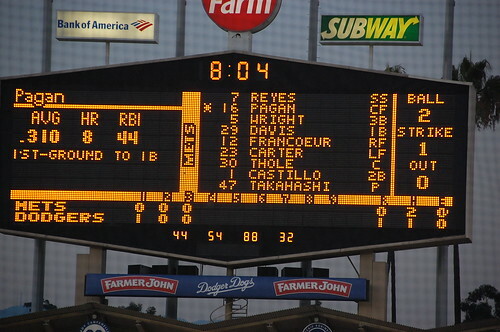 You already know that the scoreboard is not a highlight of this ballpark; I wish they had stayed full-on Wrigley or Fenway with only a tiny scoreboard, because then you would not be continually bombarded with what are in effect commercials for the Dodgers, various celebrities posing to tell you THIS IS MY TOWN. 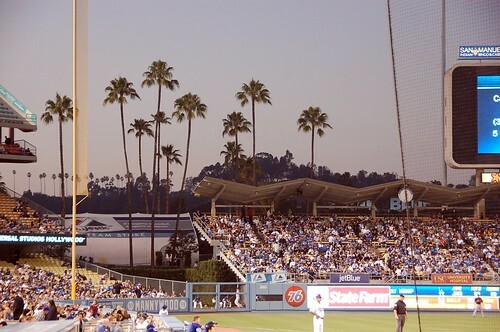 On that note, Randy Newman’s “I Love LA” is the theme song for the Dodgers, played at the start of every game. I cannot argue with the appropriateness of this in any way. 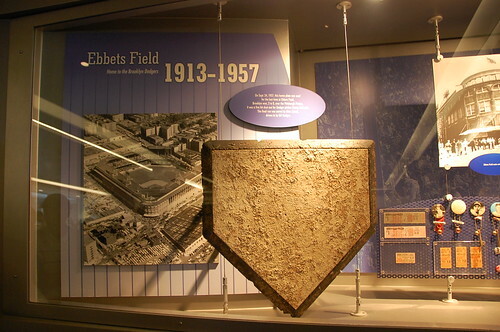 This was also the first and only tour I have been on where you were specifically told that you could touch the infield grass as much as you wanted to, you could rest your arm on it, you could even take a few blades – you just couldn’t stand on it. If you think people did not do all of those things, you are wrong. It was fantastic. It’s worth taking the tour because you get to drive all the way in to the upper deck entrance, which is so far from the gate that there’s a long blue line painted on the concrete to guide you. 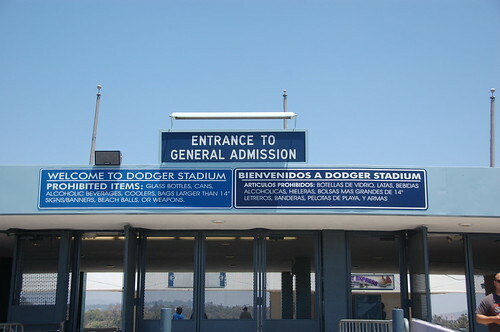 The box office is there, too, and if you’re in town and just want a peek at the ballpark, drive up to Chavez Ravine and tell the guard you’re there to buy tickets or go to the team store. The upper deck was wide open for anyone to walk in and take a look – a positive side of there being only an elevator connection between the different levels. 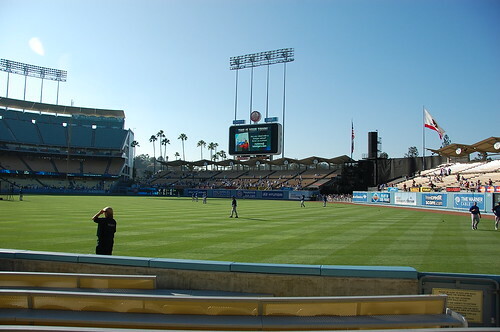 I will probably be back, because it is Dodger Stadium, after all, but next time I swear that things will be different somehow.